Very quick overview of features. Since making the video - we've added Sonos, Youtube, Guest Mode, Album Art and more. Imagine right now - open another tab on this browser - see all your music and 40,000 radio stations. Search, Play, Turn up the volume. At its simplest B2 is a micro jukebox. You can use it like a CD player - just put a CD in and press play. But press another button and B2 copies the CD onto the hard disk. Track, Album and Artist names are added as you load so you can find music by name. Store all your CDs on the hard disk and get instant access to any track and play unbroken music at the touch of a button. B2 uses FLAC compression that's a lossless compression technique so B2 stores an exact copy of what is on the CD. (See Martin's simple explanation of compression). 2Tb model can store 5000 CDs as FLAC. Find music quickly - it takes just a few seconds to search for a track by name. Or simply scroll through albums using the volume knob. If you want utter simplicity - the Next button turns B2 on and plays your music at random - don’t like what it plays just press again - music as simple as an electric kettle. Listen to your favourite radio station - via the internet - now over 38,000 stations - so you can listen to New Orleans in Cambridge or BBC Radio Four in Spain. You can operate B2 from the front panel or with a remote control but its the Web User Interface (Web UI) that transforms how you will enjoy music. The web user interface lets you control your B2 from your sofa with a laptop, tablet or smartphone. It is simply the most natural way to choose and play your music. Its how Hifi was meant to be. You will never go back. B2 has its own 15W+15W RMS power amplifier with chunky 4mm plugs if you want a simple one box music system. (30W RMS means uncomfortably loud in my office). There is an optical SPDIF output on the back so you can deliver the music to a high end DAC or high end audio equipment for uncompromised audio quality. This message bears repeating - the B2 digital output is identical to and therefore as good as any high end CD player. Regardless of price. B2 has Bluetooth so you can play music from Spotify or iTunes etc. on your mobile phone or tablet through the B2. B2 is machined from solid aluminium and has either a black or stained brushed aluminium front. Its impressively solid and can take a 70kg load (me). 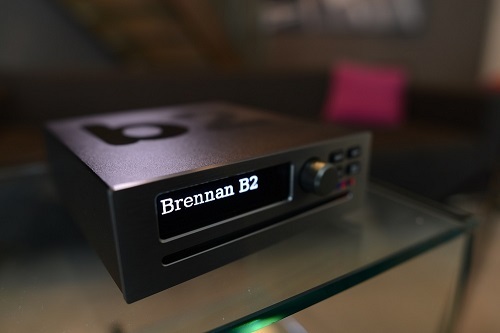 Transfer music into B2 from your Brennan JB7 or Apple iTunes or PC using a USB hard disk. Backup to an external hard disk so your music is safe in the event of a breakdown. Big bright display that you can read from across a room. New features - are being added every month. Upgrade the software in seconds over the internet. Order through our shop or through Amazon. A B2 turns a bit of shelf space into your world of music. "The best CD ripping machine that we’ve tested - A Must-Have For Discerning Audiophiles"
"I can't praise this kit too highly"
"This is the best piece of kit I’ve ever used. It is a completely stress free way to store and listen to all your music. I’m enjoying my CD collection all over again now that it’s so easy to access. And the internet radio is an amazing added bonus!" A new web UI for mobile phones has been written from scratch. The new UI runs in parallel to the original and avoids the compromises that come from trying to make a web page that works on a desktop and a mobile phone. Its already my preferred way to use the B2. Experimental fun new Youtube functions brought into main Web UI. We have restarted production of key JB7 components so we can service JB7s until 2020. Audio Tech can now revitalise your JB7 with a new display - see here for details. Thinking of trading up to a B2? - Audio Tech will buy your old JB7 - even if its not working. "I have to say, too - if you thought the JB7 was good (and it was - a good friend bought it off me, and loves it), the B2 is amazing. Steve." We've extended B2 so that you can use it with Sonos. Turns out its almost like Brennan and Sonos were made for each other - a real joy. Sonos: neat wireless speakers and slick software. Brennan: ripping and music storage, old school physical controls and high quality stereo sound. I am working on a series of videos to make it easier to understand and use the B2. This is the first. Let me know anything you find confusing about B2 and I'll try and explain in a video. It took seconds to pair the new Amazon Echo Dot (£49.99) with my Brennan B2. Tap Settings on the Alexa App then pick the Alexa product you want to pair (I only had the one). Then tap Bluetooth. After a moment you will see the Brennan B2 listed. Tap and it's paired. After that Alexa speaks and plays music through the Brennan speakers. You don’t need the app again. Alexa is intriguing technology and promises to be a lot of fun over the holidays. Similar services are coming from Google and Apple - I think Echo Dot is a great (inexpensive) way to to try out this exciting technology. 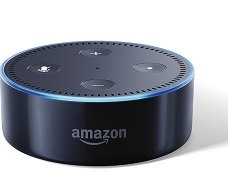 NB just to be clear Alexa doesn't control the Brennan it simply plays through Brennan using Bluetooth.